It wouldn't be spring if I weren't harvesting some tender lettuces from my garden! Here's how to create the tastiest salads from your Iowa garden. Back home on the Kansas farm, my mom grew one kind of lettuce. It was always leaf ('Black Seeded Simpson', in fact) and it was always prepared one way: Wilted lettuce salad. I adored it, but these days I'm finding there's a whole world of lettuces that most gardeners don't explore. Lettuces are cheap to grow (yet expensive to buy in the store), are ready to harvest in about three weeks, don't take much space, and good for you—so have fun! Head lettuces are tricky to grow, even in ideal conditions, and Iowa is not ideal. • All lettuces need full sun, at least 8 hours of direct, unfiltered light a day. Sure, some folks say they can take shade—and in some cases in Iowa lettuces will tolerate a little afternoon shade—but our nothern sun is indirect enough that all our veggies usually need all the sun they can get. • Plant in early spring, a week or two after you can easily work the soil. Lettuces thrive in cool weather. Replant small batches every two weeks thereafter to assure longer harvest times. I'd stop planting in May. • Keep well watered for the most tender, flavorful lettuces. Water-stressed lettuces tend to be bitter. • With those later plantings, choose lettuces that bill themselves as "heat-tolerant" so they don't go bitter in the heat, the way lettuces can. 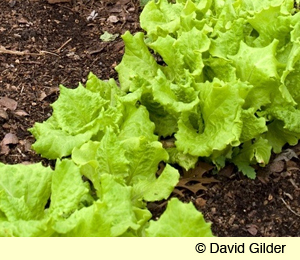 • In early September, try your hand at a fall planting of lettuces. If the weather is hot, germination can be iffy. Or you may enjoy yet more delicious lettuce! • It's critical to harvest lettuces young, before they bolt--that is, start getting long stalks. At that point, they are bitter and should be pulled out. • I like to harvest leaf lettuces with the cut-and-come-again method: Just cut off the leaves when they're a few inches tall to about 1 inch high. They'll grow back 2 or 3 times. No additional seed or planting time needed!